Garth is LightSpeed’s Project Manager. Garth was a project manager in KwaZulu-Natal for several years, before relocating to Cape Town. In his spare time Garth enjoys playing sport – trail-running, mountain biking and squash to name a few. You could also find him on his motorbike in far flung parts of the country. LightSpeed developed integration software for WordPress that enables you to capture leads and contacts from any Caldera Forms form that your website is using, and send them to your Zoho CRM account. We have recently upgraded this Caldera Zoho CRM Integration Plugin to support the newly released Zoho API 2.0. The most notable changes in the API is the use of JSON for requests, and the use of the OAuth 2.0 protocol for authentication. For a more detailed list visit the Zoho website. At the same time, we prepared the plugin for release to WordPress.org, and the plugin is now freely available for download there. Although the plugin is free, LightSpeed will offer premium paid support if you require assistance with the installation and configuration. Our documentation should contain everything that you need to get started. The plugin adds the form processor options to all forms, but the first step is to create the Zoho Client App, which connects your Zoho Account and WordPress website. Detailed instruction for this step is in our plugin documentation and also on the Zoho’s help pages. After that, the Caldera Forms functionality that we all know and love is used to add the Zoho processor (Contact, Lead, Task or Deal). 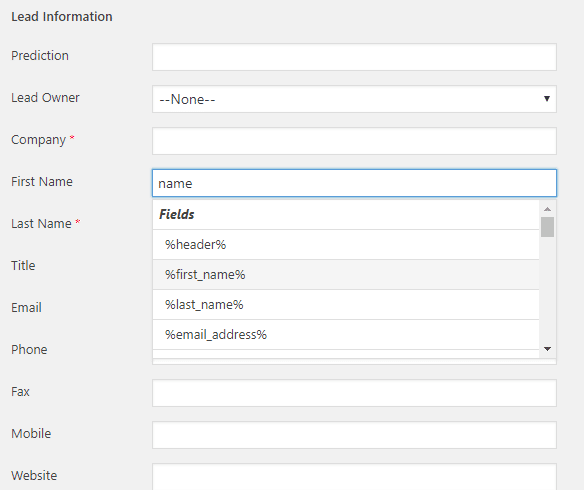 Adding Zoho processors to your form. After you’ve added your processor you need to map the fields in Zoho to your Caldera Form fields using magic tags. Mapping Zoho fields to Caldera Forms fields. LightSpeed Development is a WordPress development agency based in Woodstock, Cape Town. The company has developed the LSX Theme and associated extensions which add functionality for creating simple, yet beautiful websites. Recently we built in Gutenberg compatibility, and have developed the LSX Blocks plugin soon to be available on WordPress.org.